Part of our custom Athlete Series, this special edition of the Cerakote Women’s Bella Bar features exclusive colorways and graphics inspired by CrossFit Games champion and Rogue athlete Katrin Davidsdottir. 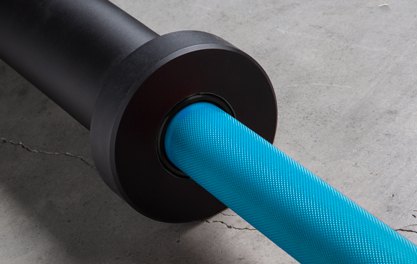 The 15KG, 190,000 PSI barbell is fully machined and assembled in Columbus, Ohio, and includes black composite bushings with standard Bella Bar endcaps. Iceland native and 2-time CrossFit Games champ Katrin Davidsdottir is represented here with a blue cerakote finish on the shaft, contrasted with black cerakote sleeves. The center of the shaft features Katrin's sled-dog logo (in white) on one side and a black Rogue logo on the other. Iceland native and 2-time CrossFit Games champ Katrin Davidsdottir is represented here with a blue cerakote finish on the shaft, contrasted with black cerakote sleeves. The center of the shaft features Katrin's sled-dog logo (in white) on one side and a black Rogue logo on the other. The words "The Bella Bar: Davidsdottir Edition" are cerakote'd onto the inside of each collar in white. Cerakote has been a game changer in the industry; a polymer-ceramic composite coating first popularized in the gun industry for its durability in thin applications. Offering wear and corrosion resistance up to 100X that of black zinc, it’s a finish worthy of the greatest athletes in the world. 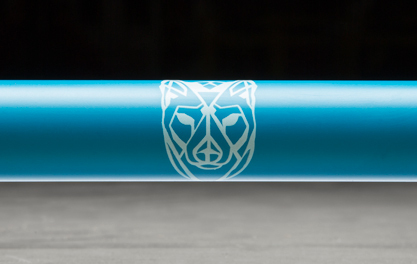 The versatility of this finish also enables us to create a wider array of customized Rogue Athlete designs, including the blue-and-black color scheme and wolf logo of the Davidsdottir Edition. 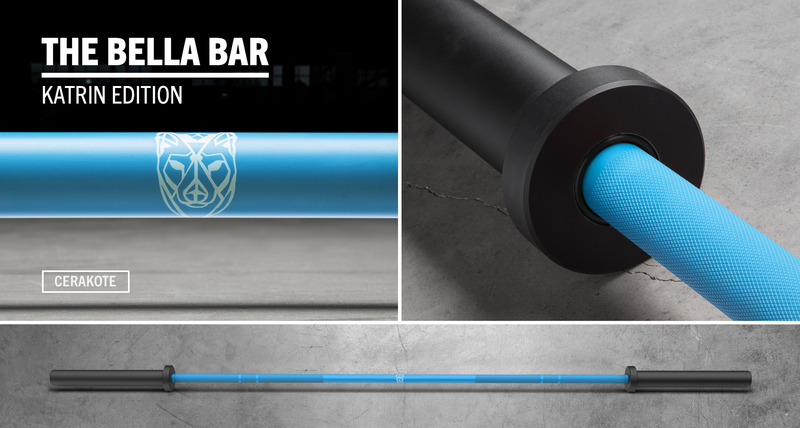 The steel in our Cerakote Bella Bars is manufactured in the US and has proven to be one of the best steel variants for a multi-purpose barbell. 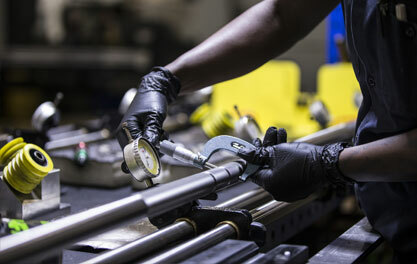 Each barbell shaft is ground and polished prior to machining, further ensuring a smooth finish and optimal performance. Built to International Weightlifting Federation standards for women’s competition barbells, the 15KG Bella Bar offers a slightly condensed size from standard men’s bars without sacrificing any of the performance elements. Every bar shaft is machined in Columbus, Ohio, with carefully refined knurling for a firm but non-abrasive grip. The snap ring design and quality composite bushings in these Athlete Editions help produce an ideal combination of the consistent “whip” needed for Oly lifts and the ample rigidity required for heavy powerlifting. Bar Length: 79.13", Loadable Sleeve Length: 13.00"